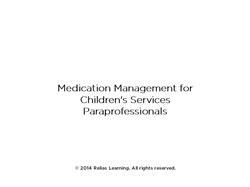 As a Children’s Services Paraprofessional, being familiar with medication management skills is essential in maintaining a high level of safety for those in your care. This course includes important information intended to increase your knowledge of medication management and reduce the risks associated with medication administration errors. Included within the course is an overview of medication management; understanding medications; medication administration; state regulations and common policies and procedures; and ideas for practice. Ms. O’Connor has held positions as staff nurse, charge nurse, educator, and clinical instructor with over 25 years of clinical practice in a broad range of specialties: medical/surgical, public health, and the operating room environment. She also was a clinical and didactic educator for a community college healthcare program. Prior to becoming a Registered Nurse, Ms. O’Connor successfully challenged the Practical Nursing Boards in WV. As a Surgical Services Educator, Ms. O’Connor created and implemented a Surgical Technician program for non-licensed operating room employees in a highly respected community hospital. She also has been a nurse planner, with experience in planning, developing, implementing, and evaluating continuing education courses for nursing personnel through the continuing education process. A veteran of the U.S.A.F., Ms. O’Connor is committed to creating relevant and intelligent continuing education courses for healthcare professionals throughout the continuum of care. Disclosure: Rachel O’Connor, RN, BSN, M.Ed., Content Writer / Editor, Relias Learning has declared that no conflict of interest, Relevant Financial Relationship or Relevant Non-Financial Relationship exists. Lindsey R. Goldberg, MSN-Ed., RN began working in the healthcare industry in 2000. Lindsey began her journey in the healthcare industry as a medical records clerk for a large Neurosurgical practice in South Florida. She then progressed to a Medical Assistant in 2001 and worked in the settings of orthopedic, primary, urgent care and concierge practices. Lindsey graduated with highest honors from Nova Southeastern University in 2007 with her Bachelors of Science in Nursing. As a registered nurse, Lindsey worked mainly with the adult and geriatric populations in the acute care hospital setting. The areas she worked in the hospital included: telemetry, medical/surgical, observation, chest pain and step-down units. While working as a registered nurse, Lindsey continued her education and obtained her Masters of Science in Nursing with a specialty in Education in 2015. After obtaining her Masters degree, she taught briefly at a community college in the nursing program as a clinical instructor. During that timeframe Lindsey was also involved in a pharmaceutical trial in which she administered the trial drug and followed one patient throughout the entire process. Lindsey also maintains her clinical skills by working for an after-hours triaging service. In her most recent position, she was a chronic care manager and health coach for Medicare patients enrolled in a digital health program. In this role, she provided health coaching, general wellness tips and diagnosis specific teaching for roughly 1500 patients. She currently serves as a medical content writer and internal subject matter expert for Relias Learning. Disclosure: Lindsey R. Goldberg, MSN-Ed., RN has declared that no conflict of interest, Relevant Financial Relationship or Relevant Non-Financial Relationship exists. 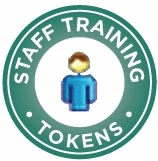 The target audience for this course is: entry level Direct Support Professionals; in the following settings: Health and Human Services.